Wacom is popular for their excellent – top of the line display tablets. Most of their tablets are very expensive for beginners and sometimes for even professionals. There was a need felt for a cheaper Cintiq device for those who wanted better drawing experience at pocket-friendly prices. 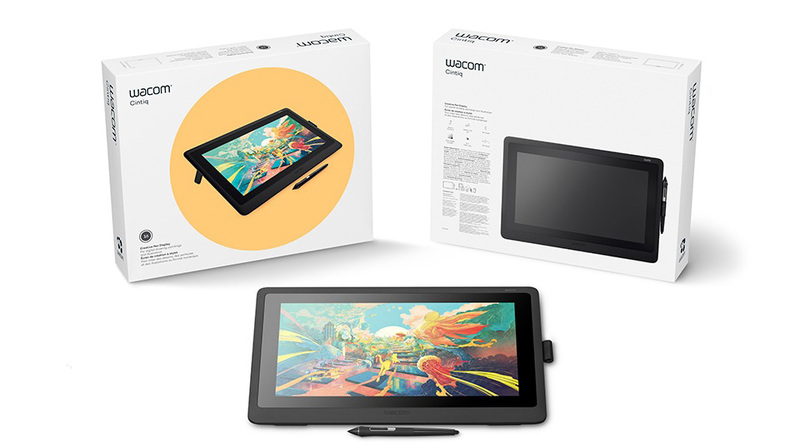 Well, it seems like Wacom have listened to people and finally released their cheapest display tablet called Wacom Cintiq 16. But there is already a number of budget tablets in the market, some of which are really good. In this review, we will take a deep look at what Wacom Cintiq 16 has to offer, and how they have managed to lower its price so much. We will also figure out how this tablet stacks up with the other display tablets in the price range. In the end, we would give our opinion to whether you should buy it or not. 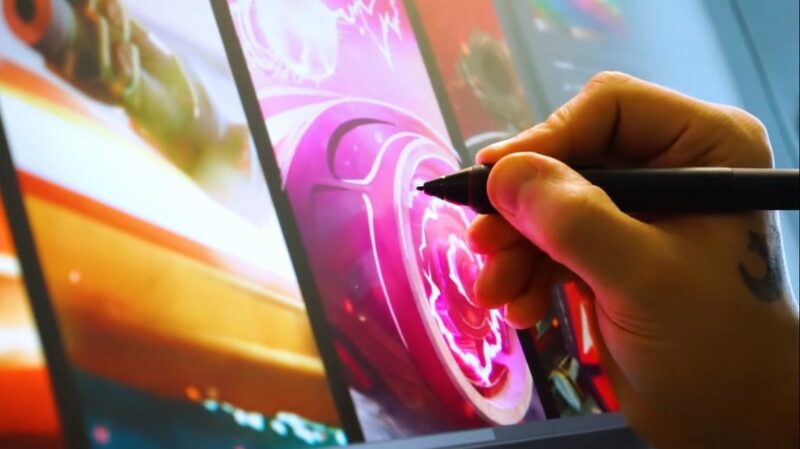 Tablets made by Wacom are popular for their well thought out, unique designs – which really helps the artists in their workflow and that is the reason why they are preferred over others. Wacom Cintiq 16 also comes with these inherent features which will make you feel right at home, even when you are coming from the higher priced models. The tablet has a modern – minimalist design approach with nothing but a screen and a narrow power button on the top. There is an indicator light around the power button which could be dimmed or completely turned off in driver settings in case it is too distracting. Flipping the device to its back, we can see screw holes for the Vesa mounted tablet stand and preinstalled pop up legs. The connection points are well concealed under a plastic cover to make everything look neat. Pop up legs can raise the device up to 19 degrees, which is a very comfortable drawing position. The legs fold up and sit flush with the device while not in use. If you want more flexibility than you can get a compatible Wacom stand – which gives you more adjustment angles to work with. The device has a scratch resistant – toughened glass at the front. Other than that, the whole body has a plastic construction. The plastic used here feels dense and ages well with no degradation as some other plastics do. It is very important for a drawing tablet to have a color accurate and bright screen. The Wacom Cintiq 16 comes with a 15.6 inch 1920 x 1080p full HD screen which covers 72% of NTSC color space. It may not be as accurate as some of Wacom’s other models but given the price, it is decent enough. The screen has an anti-glare coating which not only reduces reflections but also gives friction while drawing. The friction is well balanced for most of the people, it is neither too aggressive or too subtle. It provides little to no resistant to your hand allowing them to flow smoothly on the surface. A pen is the most important part of a drawing tablet. A good stylus can make your drawing experience better, even on a not so good tablet. Unfortunately, this is where all the Cintiq alternatives fall apart. Wacom Cintiq 16 comes with the top of the line Pro pen 2. It is miles ahead of other pens which comes with non-Wacom tablets both in terms of features and quality. Cintiq 16 comes with the same pen which comes with other premium Wacom tablets such as Cintiq 24 and Cintiq 32 display tablets. 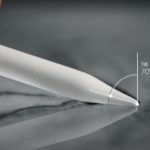 It is the best stylus in the market – and considered even better than an apple pencil. Holding the pen you will notice, the pen is slightly wider than an actual pen and many artists like it this way. There are two side buttons which are fully programmable through the driver. There is also an eraser at the back which works with all the main drawing and designing programs. Like the other two buttons, it can also be customized to do another action. The pen is made of plastic and has a rubber-like material at the front. It is center weighted and feels very comfortable and balanced, which makes it easier to use it for a longer period of time. The pen comes with extra nibs – which is interchangeable once it gets worn off. The extra nibs are present in the pen holder loop located at the side of the tablet. There are a lot of minor things which adds up to make a big difference in how a pen works. The initial activation force, the pressure balance, and responsiveness are some of the key factors which determine the pen performance. The Wacom’s pro pen 2 start to draw once it touches the surface without the need of any excess activation pressure. Its transition from low to high pressure is smooth with no inconsistent pressure bumps. Cables are flimsy, distracting and usually the first thing to get damaged – no matter what the device is. The wireless technology is not competent enough as of now to transfer real-time image and pen data. So most of the devices aim to minimize wires. The Wacom Cintiq 16 connects to the computer through a 3 in 1 cable. 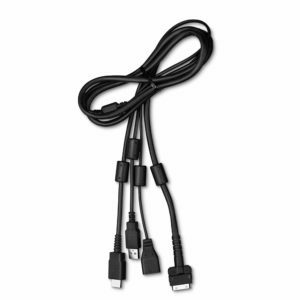 The first cable connects to an HDMI port, the second cable goes to USB-A port and the third cable connects to the included AC adapter. For those whose computer/laptop does not have HDMI and type A USB port, you will need to grab a USB hub. On the other hand, a single cable connects to the tablet. The tablet has unique cable management which keeps the cable out of your way and makes your setup look neat. The cables including the AC adapter is long enough for most of the people and you will not have issues even if your CPU is away from the desk. As you may have observed by now, Wacom Cintiq 16 do not have any customizable buttons on the tablet. If you really want to use shortcut keys – then you will need the Expresskey remote. The Expresskey has a total of 17 buttons and a touch ring, which gives you more than sufficient buttons to work with. Its buttons have different shape and sizes along with little-raised bumps and dots to help identify them without looking. It connects wirelessly and works very well. Side bezels of the Cintiq 16 are not big enough to hold the Expresskey remote and there are no magnets to hold it like what we have seen in premium Cintiq pros. On top of that, the remote itself is quite expensive and has to be purchased separately. 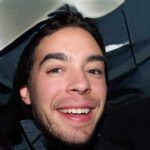 If you don’t want to get an Expresskey remote there are alternatives. Other than the keyboard, you can also use the on-screen buttons for shortcuts. 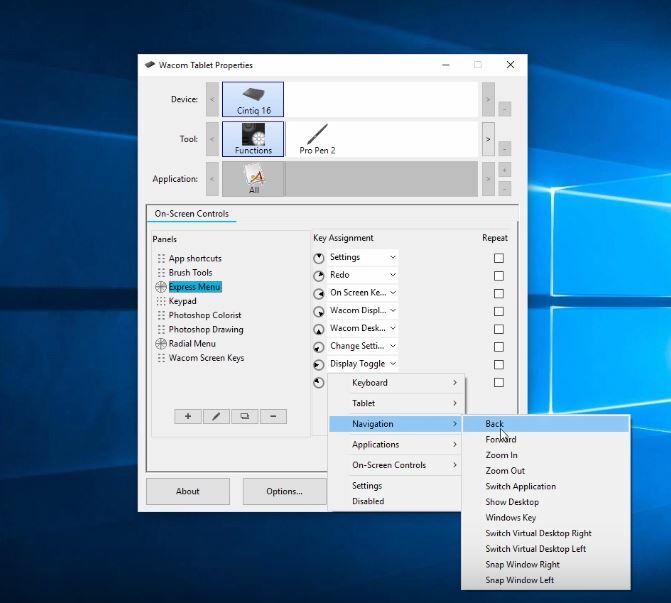 The Wacom driver gives you full customization for the on-screen buttons and they are easy to work with once you get the hold of them. Wacom has one of the most stable, reliable and easy to use Driver. The driver allows your computer to communicate with the tablet and understand pen, pressure and tilt data. It also gives you extra settings to fine-tune your tablet as per your liking. The latest version of the Cintiq 16 driver is available to download from the Wacom’s official site. The driver allows you to customize shortcut buttons on the pen as well as Expresskey remote. It also allows making changes in the pressure sensitivity of the pen – which controls how hard or soft you have to press to see stroke variations. By default, the screen is perfect and needs no calibration in most cases. In case you want to make changes, the driver gives you additional settings for color, brightness and contrast. One of the advantages of Wacom Cintiq 16 is – it supports many of the Wacom’s accessories. Starting off with the pen, the device supports Wacom Pro pen 3D as well as all the other specialized pens like grip pen, airbrush and art pen. Next, as we already mentioned – the tablet has no shortcut buttons but it supports Wacom Expesskey remote. The tablet comes with a mini stand but it also has holes at the back for the Vesa mount. So you can use any Vesa mount supported stand including the Ergotron stand. Setting up the Wacom tablet is quite simple, here is a tutorial to help you with that. Connect the HDMI and USB cable to the computer/laptop. One of the best way to know how Cintiq 16 compares to Cintiq Pro models – is to compare it with the Wacom Cintiq Pro 16. They both have similar screen size and very comparable in a lot of other ways. Cinitq 16 and Cintiq Pro 16 are 16 inches in size and have very comparable build quality. They both come with the exact same pen and supports the same accessories like Expresskey remote. 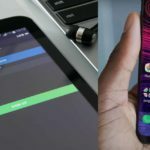 Both of them works as a secondary screen and have to be connected to an external computer instead of being a standalone device. Talking about differences – The pro model has a higher resolution screen and slightly better color. The pro model is thinner and has a smaller footprint. It supports touch input and has a magnetic side bezel for sticking express key remote and lastly, it comes with a pen stand. If you take a closer look at both the tablets, you will find that in spite of the major price differences there are a lot of things which are similar, and the differences are not that big. Like – for sure 4k resolution is great but on a 16-inch screen even fullHD is sharp enough, or the touch support is cool to have but many people disable it anyways. These differences may increase convenience a bit but do not affect your work in any major way. You get the same pen and with the same textured glass with exact same basic drawing features, so no difference there and that is why you are getting “80% of the tablet at 30% price“. Wacom had to make some smart decisions in order to cut the cost without losing much of functionality. We are going to take a look at what are the things they have compromised to bring down the price. Screen – Unlike the pro models, the Cintiq 16 has a 1080p full HD screen with 72% NTSC color gamut in place of 99% Adobe RGB in pro models. In this way the screen may not be as good as it can be but still is decent enough to work comfortably without any noticeable difference. It is still one the best screens you can get in this price range. Accessories – Wacom Cintiq 16 does not come with any pen holder. In place of that, it comes with a little fabric loop to store the pen which is placed at the side of the screen with extra pentips stored in it. No touch – You can argue touch is an important feature which is absent in this model. But the truth is, the touch controls in the Wacom tablets are not very fluid and they tend to interfere with the hand while drawing due to its average palm rejection capability. So most of the artists end up turning it off while drawing. Besides that, all the zoom/rotate function can also be done through the Expresskey remote. 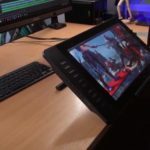 For this comparison, all the Cintiq alternatives under the range of 500 to 800 dollars were compared and here are the most common trends we found. All the display tablets under this range had 1920 x 1080p resolution screen. Almost all the tablets screens had the same 72% NTSC color space with more or less similar display quality. Some of the devices had a bigger screen with few of them reaching up to 21 inches but they were lacking some other key features. Last but not the least – almost all the tablets have some sort of anti-reflection coating. They also came with surface texture but were not as good as what you get with Wacom. The textures on Cintiq alternatives tend to fade away after a while. This is one of the few areas where Wacom Cintiq 16 lacks heavily especially when we compare it to other tablets. 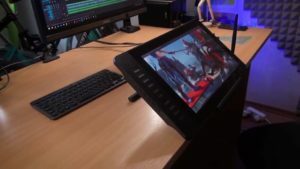 If we take a quick look at some of the Cintiq alternatives, we can see they are fully equipped with all kinds of shortcut options. Some of the devices have a single row of a button whereas few have buttons on both sides of the screen. They also come with one or two touch bar which helps with scrolling and changing brush sizes. If we consider the Wacoms official accessory the Expresskey remote which has 17 buttons and a touch ring. It becomes superior shortcut option than all the other tablets. The Expresskey remote is wireless and can be placed anywhere. But at the same time, it is quite expensive and has to be purchased separately as an addon. Wacom is popular for their excellent build quality and that is the reason their products last for a very long time. Looking at other products in this range we found only a few tablets matched the quality what you get with Wacom. Most of the devices have used cheap plastic and some sort of protective film to protect the screen. Which wears off very easily. Cintiq 16 comes with the pro pen 2 which is the best pen in the market. No other pen comes anywhere near it. Many other tablets in this range boast of a pen with 8192 levels of pressure sensitivity. And they are good enough but not at the level of Pro pen 2. Unlike Wacom, most of the Cintiq alternative pens need charging and only a few of them have tilt support. Overall, Wacom has come up with a really good product and pretty much the best display tablet in this range. Most of the Cintiq alternatives which are ahead of Cintiq 16 in one feature completely falls flat in some other category. Summary – The best display tablet? After the detailed comparison of Wacom Cintiq 16 with the Wacom Pro models and other third-party tablets in the market. It is pretty easy to say that Cintiq 16 is the best display tablet you can get. It has all the basic and advanced features you need for drawing and it comes with the most reliable pen ever. Even professionals who often work with a more expensive tablet will feel right at home with this device. Some of the beginners or hobbyists may feel the device is a bit expensive, but to be honest, it is totally worth saving some money. Click here to check the latest price of Wacom Cintiq 16 on Amazon.